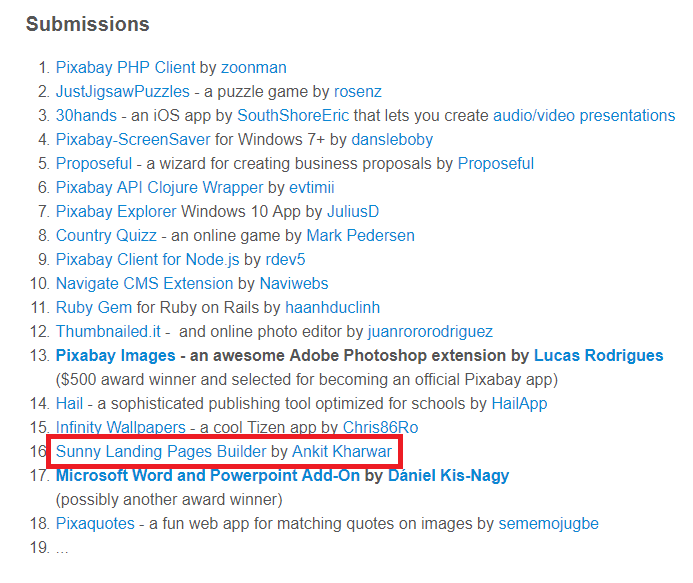 Wow, the Sunny Landing Page Builder looks fantastic! …Really great work. One of the first things about getting your landing page right is to get the right images. There are a bunch of images that you will need. Backgrounds, Hero Shots, Icons, Vector Graphics, Illustrations and perhaps even Background Videos. All of these make all the difference between an average landing page and a great landing page. Over the years, the team at Sunny Landing Pages has relied on the extensive gallery provided by Pixabay. It’s one of the world’s top websites and provides access to over 1 million images. In September, Pixabay launched a developer challenge for people interested in using their API. This sounded like a great idea for Sunny Landing Pages and we’ve managed to integrate their image search and retrieve services directly into our product. In short, that means that users no long have to go to pixabay or any other stock image site separately. You can search for what you need within the Sunny Landing Pages builder and with 1 click you can insert the image into your landing page. Let me show you what I mean by ‘integration of the API’. But first, here are some reasons why Pixabay is one of our favorites. 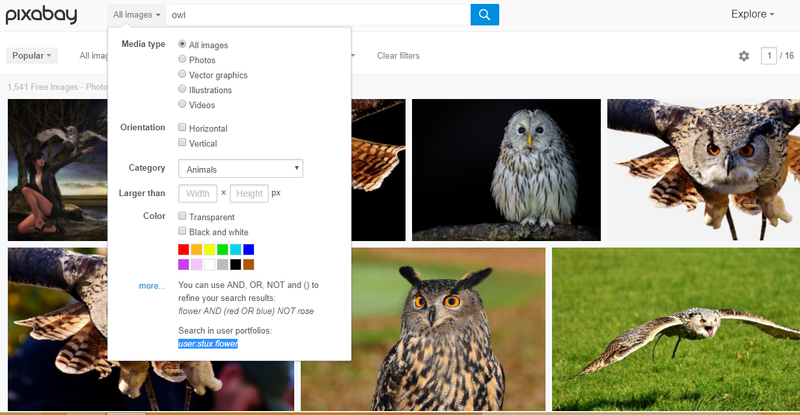 Stock Image Search: Pixabay makes it pretty easy to search for just the right image. You can search for any keyword. It has divided the images into the following categories – fashion, nature, backgrounds, science, education, people, feelings, religion, health, places, animals, industry, food, computer, sports, transportation, travel, buildings, business, music. The image type can vary from Photos to Vector graphics to Illustrations and they also have videos. Like this cute little dog. You can get images with a Vertical or Horizontal orientation. You can specify the size or color that you want and then you can download a resolution level according to your end-use. Oh, did I mention all this is free? Here’s a list of submissions that have been shortlisted for prizes. See Sunny Landing Pages at Sweet 16. We’re proud to have been shortlisted for their prizes and social media mentions but more so, we’re pretty kicked about the positive encouragement from Simon, the Pixabay CEO. First, we’ve added a new feature in our left control panel for searching images. Second, just click on any of these photos to insert into your page. Remember it’s easy to drag and drop the image anywhere on the page. If you would like to edit the image, then just click on the edit image button on the right panel. 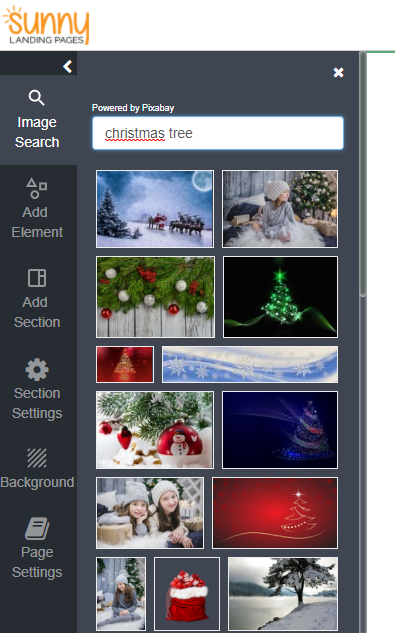 The image editor will get launched. In case you are interested, here is our detailed blog on editing stock images. Third and final – here’s how you can add an image for the background of your landing page section. Click on Background and then Image (in the right panel). Here I am looking for ‘Christmas wallpaper’. Click on Insert into page and voila! you have a new Christmas background image. So there you go – It’s a neat little integration and are users are already thrilled about it. Further reading: You could read more in our blog archives about how the right images assist conversions. Let me know what you think of this new feature in the comments!